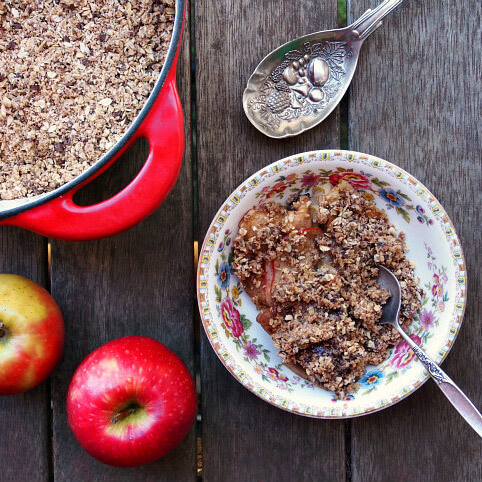 There’s something supremely comforting about apples baked with spices and brown sugar. 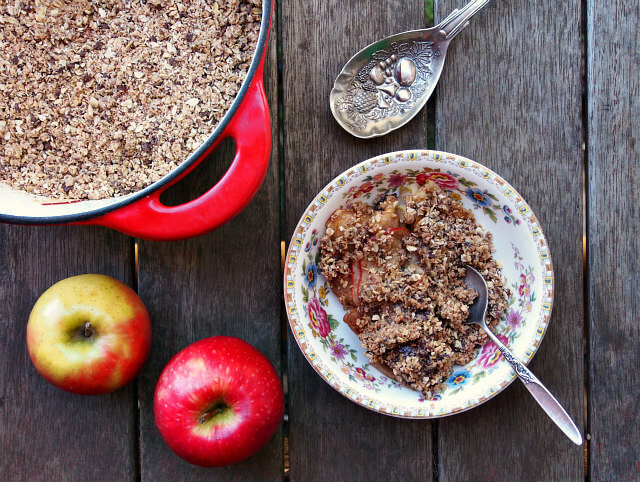 On a cold winter’s day, baked apple casserole with chocolate oat topping takes comfort to new levels of deliciousness. Baked apple casserole is simply sliced apples mixed with butter, brown sugar, and cinnamon then baked with a crunchy topping. It is lovely served warm with a dollop of freshly whipped cream or a scoop of vanilla bean ice cream. It’s even nice with a drizzle of melted salted butter. If you don’t make it too sweet, it makes a special breakfast to cheer the spirit on a dark winter morning. Just add a cup of Stargazer Caramel Mate Chai or No Obligations decaf tea and even the dreariest day is off to a good start. Baked apple casserole is wonderfully versatile. You can change up the spices, choose a different variety of apples, and switch up the topping to suit your preference. While most apple desserts use cooking apples such as Granny Smith, I’ve made this with everything from Red Delicious and Pink Lady to Fuji, and it’s always delicious. You can make baked apple casserole with chopped apples or chunky apple pieces, whatever suits your fancy, but I like it with slices. Thick slices are fine, but if you use a mandolin to make wafer thin slices of apple, the cooking time is reduced. 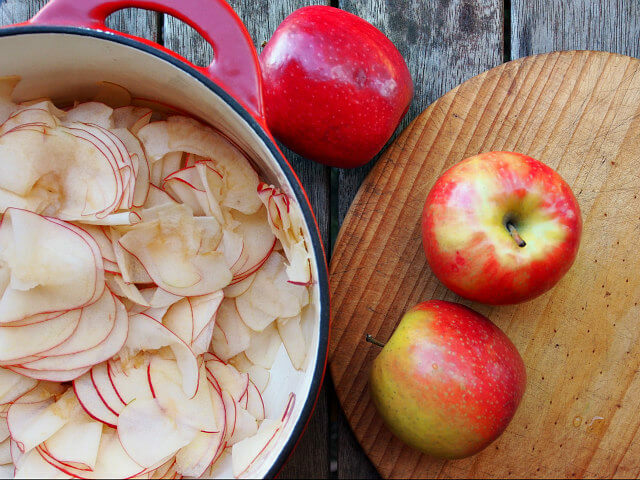 When choosing the spices for your baked apple casserole, look to the ones that have always paired beautifully with apples. Cinnamon is a wonderful choice, as are ground cloves and fresh grated or powdered ginger. I’m also a big fan of ground cardamom, and think it is splendid when mixed with freshly ground cinnamon. You can also add finely grated lemon zest or orange peel for a hit of zingy freshness, or a few tablespoons of finely chopped crystallized ginger. Slice or chop your apples into a large bowl, add brown sugar, cinnamon, and ground cardamom and mix well so all pieces are coated evenly. 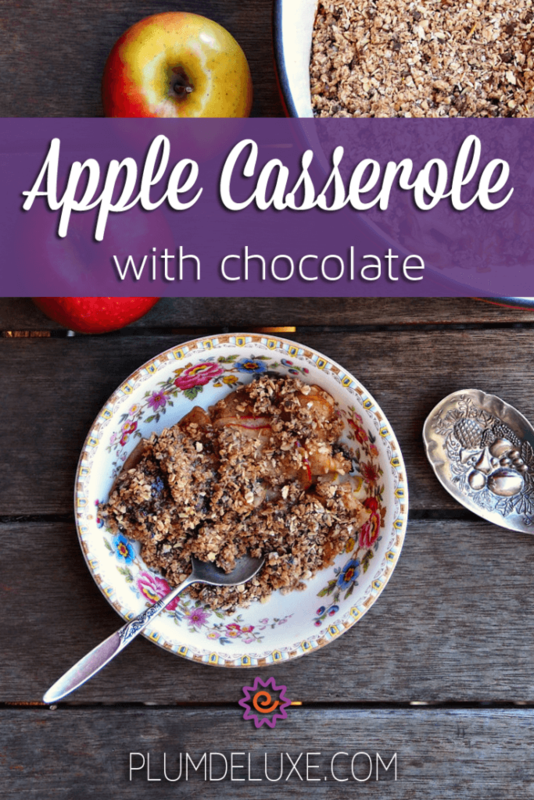 Pour the apple mixture into a 1-quart casserole dish and dot with 2-3 tablespoons of salted butter. This will melt down during the cooking time and mingle with the apple juices, brown sugar, and spices to form a luscious sauce that is rich in flavor and fragrance. Baked apple casserole isn’t quite ready until it has a crunchy topping browned beautifully in the oven. You can use bread crumbs toasted lightly in a frying pan before adding them to the apple mixture and baking a few more minutes to make them nice and crunchy, or crush your favorite cookies such as ginger snaps. I like adding a bit of decadence to my topping by putting rolled oats and dark chocolate chunks in a food processor, and processing until coarsely chopped. I add some melted, salted butter, and this forms a delicious topping that toasts nicely and adds a lovely richness with the dark chocolate pieces. Serve warm with cream, whipped cream, or ice cream — and maybe a cocktail. In large bowl, mix together sliced apples, brown sugar, cinnamon, and cardamom until evenly coated. Place into 1-quart baking dish. Top with first measure of butter. Set aside. Place oats and dark chocolate into food processor and pulse until coarsely ground. Pour into medium bowl and toss with melted butter. Sprinkle over apple mixture and bake for 20-30 minutes until apples are tender and topping is nicely browned.